What Is BDS And What Can We Do? The evening was billed as a lecture with the provocative title “BDS, Israel and Us: The Delegitmization Campaign”, but this was less of a lecture and more of a guided journey through the inner workings of a disturbing movement with its sights aimed squarely at the Jewish state. Our tour guide at the Sunday evening event was longtime Israel advocate Nevet Basker. 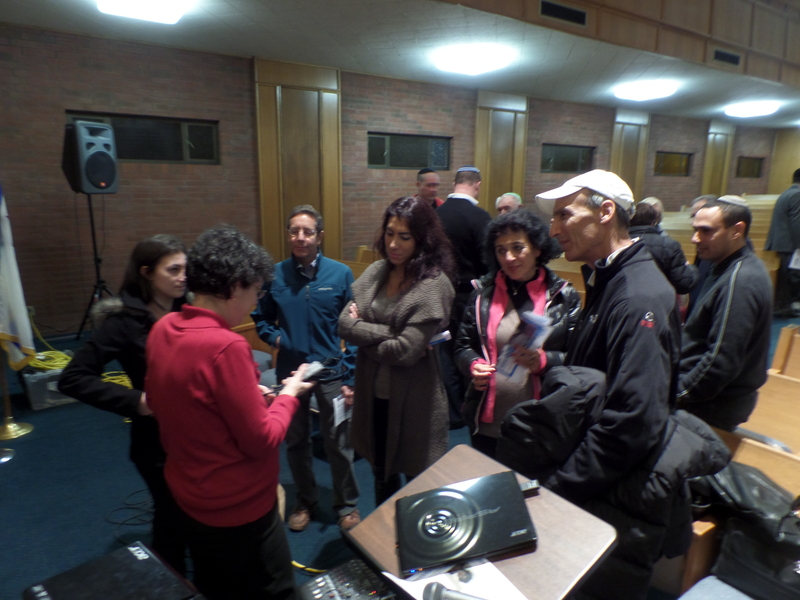 Ms. Basker shared her depth of knowledge on the topic at Sephardic Bikur Holim congregation utilizing a first class multimedia orchestra of videos, photos and graphics to expose the inner workings of the Boycott, Divestment and Sanctions movement. The fifty or so folks seated in the ornate sanctuary of the Seward Park synagogue watched in stunned silence as a middle aged couple spoke from the video screen perched above them on the bima. The pained tale of the Olympia Jewish community ripped apart at the seams touched the hearts of all present. The cause of this division? Three letters reverberating across the Jewish American landscape, B-D-S.
Ms. Basker explained that the B in BDS stands for an economic boycott of Israel and represents the BDS movement’s goal of boycotting any and all Israel associated products, including items like Sabra Hummus, which Nevet noted is manufactured in New Jersey. The Boycott also targets International artists who plan to perform in Israel as well as Israeli artists who are slated for visits abroad. On the positive side, the BDS movement has gained much publicity but little traction in their efforts to encourage an academic boycott. Utilizing videos and relevant quotes from the likes of Larry Summers, formerly of Harvard, Basker made the case that the very idea of suppressing informational exchanges between educators is anti-academic at its core. Divestment, the D in BDS says Basker, refers to efforts to discourage business to avoid investing in Israeli companies or selling their products in the Jewish state. It also refers to pressuring colleges to remove Israel from their investment portfolios. Sanctions rounds out the BDS acronym and refers to governmental led legal actions against Israel. Noted Basker “There has been zero success for the BDS movement in this realm”. Basker used videotaped remarks by BDS founders Omar Barghouti to explain the origins and goals of the BDS movement. Mr. Barghouti explained that the BDS movement was launched in July 2005 and was inspired in part by the 2001 Durban conference (an ostensibly anti-racism conference that become so enmeshed in anti-Semitic tropes that the US delegation amongst several others stormed out in protest). Nevet Basker engages with members of the audience following her presentation. The stated goals of the movement according to Mr. Barghouti is to end the occupation of “all Arab lands” and full rights for Palestinians. But third and most notably – the movement calls for the “non-negotiable” Right of Return of all Palestinian refugees and their descendants to their former homes. In other words, the end of Israel as a Jewish majority state. 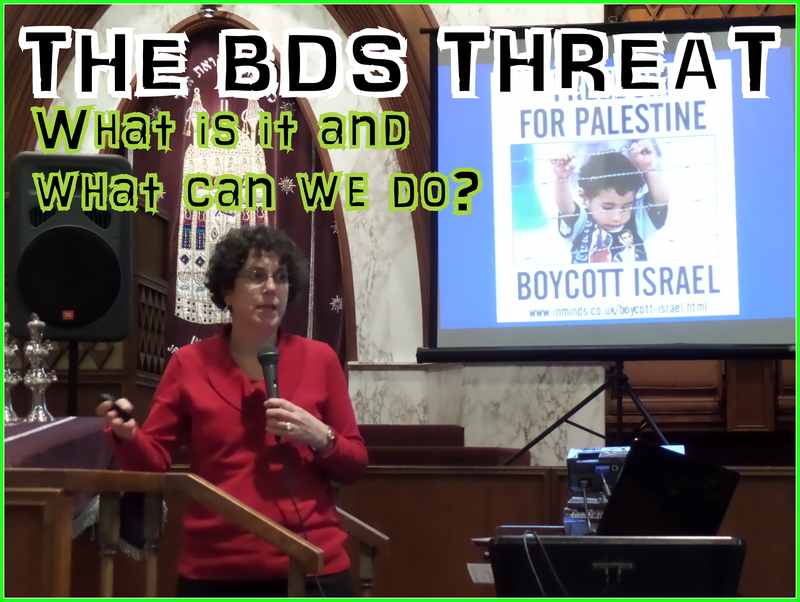 As the audience digested the unfathomable goals of BDS, Ms. Basker emphasized the point with a video of noted anti-Israel extremist Norman Finkelstein frankly sharing that the goal of BDS is the end of Israel. The presentation was enhanced by a video interview with Daniel Birnbaum the CEO of Israeli soda pop company soda stream who persuasively explained the harm caused by the BDS movement to every day Palestinians. Explained Ms. Basker “The BDS movement is nothing new and has come in many forms, from Nazi boycotts of Jewish businesses in Germany to Arab led boycotts of Jewish businesses in pre-state Israel, to the Arab League boycott of 1948. The one thing in common among the modern day efforts to boycott Israel”, noted Ms. Basker “is that while it focuses on harming Jews, it does nothing to enhance the lives of Palestinians”. The take away said Ms. Basker is the need for supporters of Israel to get involved. To challenge falsehoods about Israel, to buy Israeli products, to thank stores that carry Israeli products, to visit Israel and to get involved with an Israel advocacy organization like AIPAC, StandWithUs and others. Ms. Basker closed with an interview with members of the Olympia Jewish community in the wake of the successful boycott of the Olympia Co-op. Visibly pained, the victims of the boycott told of the unhealed wounds caused by the BDS advocates, one gentleman sharing that it is not safe for a Jew to walk outside of their home as a Jew in his community as a result of the divisive efforts of the BDS movement. During the question and answer session, a college student who helped lead the fight against BDS at the University of Washington last year shared of the anxiety and pain experienced by Jewish students on campus during last year’s BDS battle, The young woman poignantly asked Ms., Basker “how much longer will we have to deal with BDS, I mean will it ever end?” Nevet was unable to share what the young woman so wanted to hear, she told the student “The BDS advocates will continue their efforts, they don’t care who they hurt or the damage caused, college students are just pawns to them, at the end of the day it is just hate”. 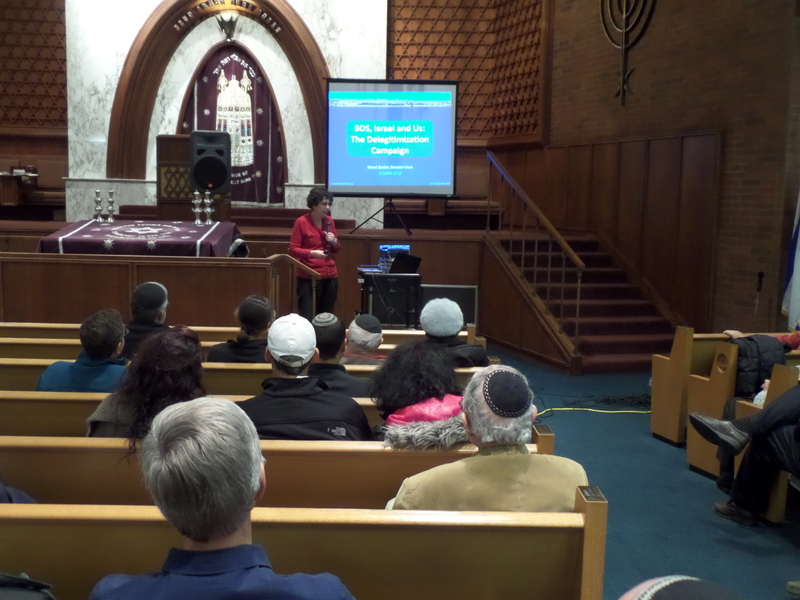 The Lecture was sponsored by Sephardic Bikur Holim, Ashreichem Yisrael, Congregation Ezra Bessaroth, Bikur Cholim Machzikay Hadath, Ohr Chadash and the Jewish Federation of Greater Seattle. My girlfriend has Multiple Sclerosis and takes Copaxone, one of about 450 pharmaceuticals developed and offered by Teva, an Israeli company. She has very few symptoms if any. Teva has developed numerous drugs to fight off cancers, and I would guess many for a boycott of Israeli products owe their lives, or at least the lessening of painful symptoms, to Teva. Teva also broke many monopolies by offering low cost generic alternatives for many drugs as soon as their patents come up. This means that more lower income people can afford the health care they need. Not to mention the fact the Israel has the only pharmaceutical manufacturing facility in the world that can mass produce large amounts of Ebola treatment serum on short notice. It would be very inconvenient if any anti-Semites ever became infected. What B. D. S. means to me is a, Border Dispute of State; ie, Israel’s RIGHT to exist in the Middle East as a sovereign Jewish State with its own unique, secure and established, Borders, Language and Culture!